A lightened up version of a true comfort food. This recipe came together when Ryan and I stood standing in front of the fridge saying, "there's nothing to eat." We stood there pondering, thinking, hungry and confused...what the heck do we do with this leftover grilled chicken?! Linguine in the pantry? Check. 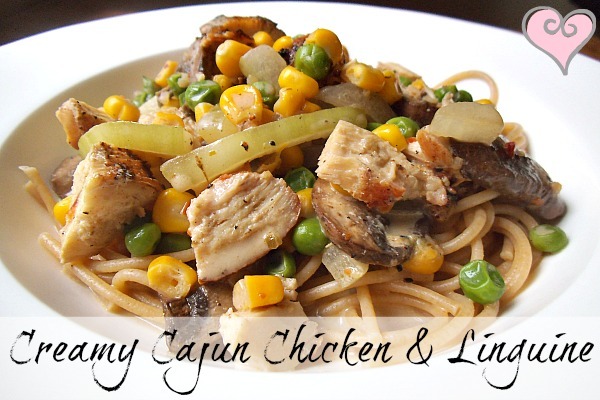 Cajun seasoning and black pepper? Check and check? Those random mushrooms and half an onion sitting in the produce drawer? Check and check. That random half used carton of low-sodium chicken broth sitting in the fridge? Check. Light cream (or half&half)? Check. (This is an easy one to grab at the corner market if you don't have it. OK...there's magic to be made in those ingredients. Throw it all together and you've got perfection...pure, satisfying, creamy perfection....only healthier! Another great thing - this took me about twenty minutes to throw together! Obviously if you still need to grill your chicken this may take longer, but it's totally worth it in my opinion. Any vegetables would work well for this dish, but I did enjoy the spiciness of the sauce paired with the sweetness of the corn, the cool of the peas and the crunch of the onion. 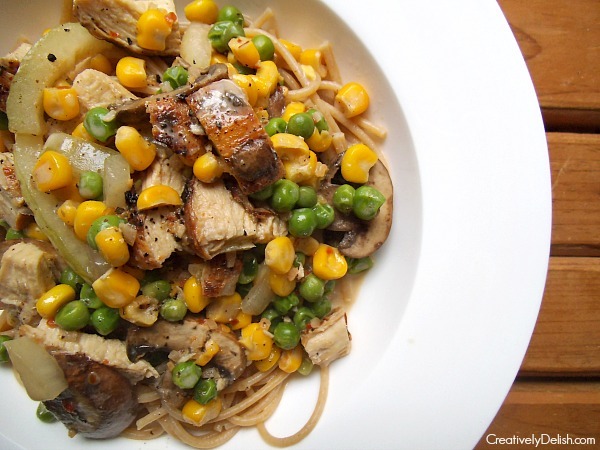 The shrooms are just a bonus and add a bit more heartiness to it. This is also something you could easily make vegetarian. If you plan on taking the chicken out, add shrimp for protein. If you don't eat any sort of animal product, let me know what you throw in instead - I'd be very interested to learn more! vegetables: whatever you have around! 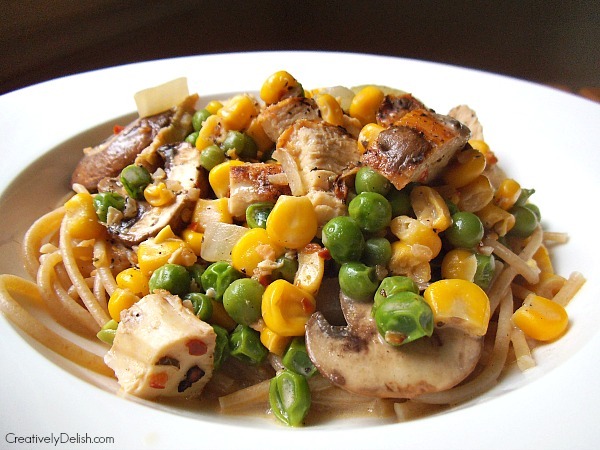 I recommend (and used) 1 C sliced baby bella mushrooms, ½ vidalia onion, sliced lengthwise into thin strips, 1 C frozen corn and 1 C frozen peas. In a large pan, heat some olive oil and add in onion, cooking for 2 minutes. 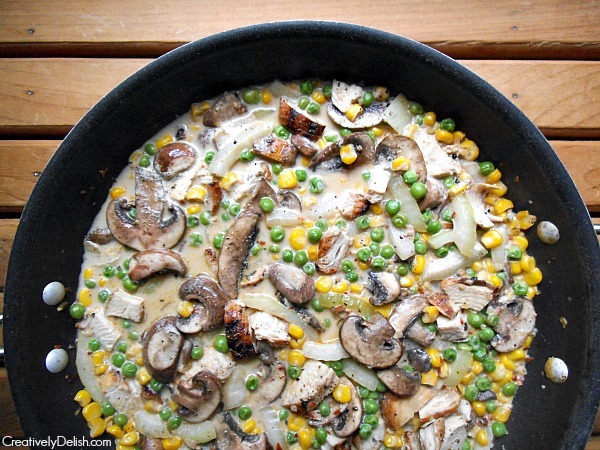 Add mushrooms, peas, corn, chicken, broth, cream, and butter - stir to combine. Let that simmer for about 10 minutes, stirring occasionally, then remove from heat and serve.